EOTech MDM1001 Beamhit 110 Interactive Dry Fire System FREE SHIPPING! Practice drawing, trigger pulling and manipulating firearm controls without wasting ammo or shelling-out expensive range fees with the EOTech Beamhit 110 Interactive Dry Fire System. The Beamhhit TR700 target coupled with the adjustable LS-101 Laser Transmitter provides fully customizable training sessions in the comfort of your home, yard or other preferred practice space. 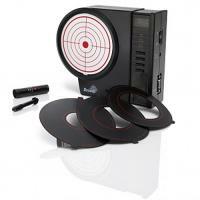 The TR700 includes three target masks of varied sizes, allowing shooters to set the size of their active scoring area. A programmable timer allows the user to set the active timeframe of each target while an LED hit counter records up to 99 hits, allowing a true test of the speed of your draw. Designed for maximum versatility, the 110 Dry Fire System includes interchangeable laser rods that can accommodate .22 to .45 caliber firearms. Operable from over 40 meters with either AA batteries or an AC power adapter, you never have worry about a power source limiting training. ©2002-2019 CopsPlus.com: EOTech MDM1001 Beamhit 110 Interactive Dry Fire System FREE SHIPPING!